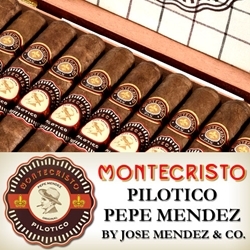 In honor of the man who changed the world of tobacco twice-over, the Montecristo hand-rolled premium cigar brand has released the Montecristo Pilotico Pepe Mendez line by Jose Mendez & Co. These premium cigars are named after famed Cuban exile tobacco grower, José "Don Pepe" Mendez. Each cigar is individually handmade featuring an aged Ecuadorian Sumatra leaf wrapped around binders infused with Dominican-grown tobaccos, and fillers consisting of rare blends of Nicaraguan and Dominican Pilotico tobaccos. The smoke from these premium cigars is full-flavored and ultra-smooth with a unique flavor profile of sweetness, spice, leather, and toasted almonds. Offered in three sizes with attractive double bands, Montecristo Pepe Mendez Pilotico premium cigars are packaged in wooden humidor boxes designed to look like vintage trunk luggage fashioned with leather straps and a leather handle. A definite collector’s piece for any cigar connoisseur! Smokers Discounts can bring Montecristo Pepe Mendez Pilotico handmade cigars right to your front doorstep. We’ve made it easy and affordable to buy premium cigars online. A variety of sizes and flavors are listed below. Each of these styles are in stock and available for a low discount price! Call us for more details!